ICD-10-CM Wound Coding & OASIS Field Guide, 2019 is the ideal resource to use when coding and documenting wounds along with the Complete Home Health ICD-10-CM Diagnosis Coding Manual, 2019. When purchased separately, you pay $418, but when you order these two products together you pay only $299, a savings of $119! 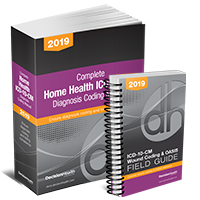 DecisionHealth’s Complete Home Health ICD-10-CM Diagnosis Coding Manual, 2019 is the only ICD-10 manual created specifically for home health coders – and contains guidance, illustrations, tips and scenarios to help you accurately code your home health claims. The ICD-10-CM Wound Coding & OASIS Field Guide, 2019 is your on-the-go reference to choose the right ICD-10 code and complete the OASIS for the most common home health wounds. It is conveniently separated into chapters devoted to each type of wound commonly seen in home health, including pressure, arterial, stasis and diabetic ulcers, and surgical, trauma and complicated wounds. Each chapter of this detailed wound reference contains ICD-10 coding principles, official OASIS guidance, expert tips, helpful scenarios, important tools and real-life wound photographs to help guide you towards accurate code-selection and OASIS answers. 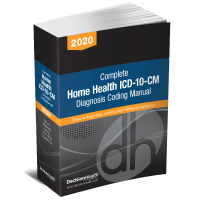 Code accurately and avoid ADRs and denials with the Home Health ICD-10-CM Diagnosis Coding Manual and Wound Guide, 2019.